I -SERIOUSLY- heart Jamie Oliver and his recipes. Reading his recipes, it’s like a conversation. Like you’re sitting in his kitchen and noshing on whatever he puts in front of you as he casually whips together a nourishing and delicious and effortless and amazing meal. YEARS ago, like years and years ago, I was half watching/half listening to a Jamie Oliver cooking show where he took his staff on some random country overnight outing or something and he woke up early to make everyone breakfast. He made something he called Brunch Bread and he measured everything using his hands and a PINT GLASS. How freaking cool is THAT?!?! I wanna measure everything only using pint glasses. Maybe a shot glass or two as well…. I picked up two of this cookbooks (Jamie’s Dinners and Jamie’s Italy) at the library the other day and have been leafing through them ever since. This morning I decided to attempt his Ultimate Onion Soup his version of French Onion Soup – as it’s one of C’s favorite-of-all-time soups and one I don’t think i’ve ever had before (in a restaurant it’s made with a beef broth and covered in cheese – a no-go combo in the kosher world). So Mr. Oliver suggested you can sub out the beef broth for veg broth, and when I checked in with my bestfriendgoogle, it turned out that I ACTUALLY had on hand everything I needed to make my own veggie stock. HUZZAH! I even had the required Gruyere and a whole baguette too! DOUBLE Huzzah!! So I started with the stock. 5 smallish carrots (didn’t peel), leafy ends removed – don’t use too many or your broth will be sweet. 1 bunch of fennel fronds & stems – more and your soup will taste of licorice. Blech. 3 small onions, quartered – leave the skins on to add color to the soup. I used the standard little yellow ones. 3 Tablespoons of Olive Oil (I am guestimating here how much I used. 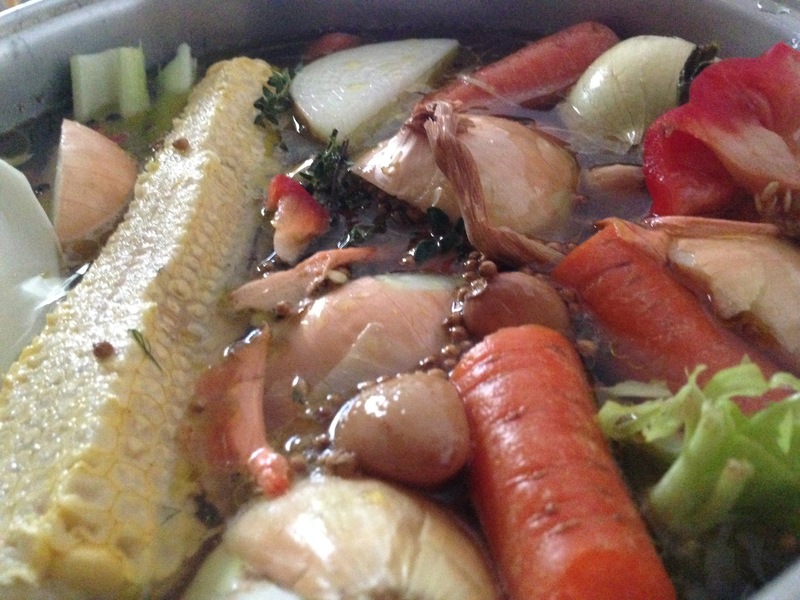 The olive oil adds a nice richness and fattiness to the finished broth). Salt – probably 1 teaspoon, but again, I’m guessing. I almost always under salt my soups, stirring more in at the end when all the other flavors have had a chance do their melding-happy-dance. Then, I covered everything with water by about an inch, brought it to a boil, turned the heat down to simmer and covered the pot. I walked away and came back like, I dunno, 30 minutes later. I took the lid off, let it cool for an hour or so while C & I took the kids to the playground. 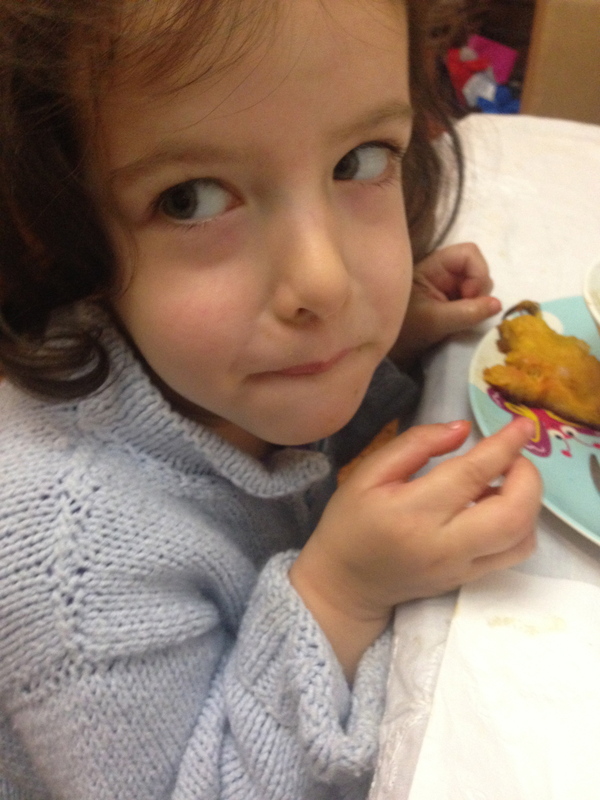 When we returned I strained out all the solids from the soup, setting it aside for later. So the onion soup calls for 2.5lbs of sliced onions. I used one of those small net bags of onions. The whole freaking thing. So you use olive oil, butter, garlic, a bay leaf, and thyme to cook the onions over a low heat in a big old pot with a lid. After the onions have cooked down a bit, you take off the lid so they can get some color, then add in the broth and let everything simmer away for a bit. Then you taste and correct the seasonings – which, for me, means adding salt. Then you ladle your soup into bowls, stick in your bread, drizzle with olive oil, sprinkle with cheese, then shove under the broiler for a few minutes. It was somewhere between adding the stock and slicing the cheese when C looked at me and said, um, usually people eat French Onion Soup out of crocks. We don’t own any crocks. A quick search of the kitchen and its surrounds proved how lacking we really and truly are in oven proof dinnerware. We (I, really) decided to risk it using our standard Crate and Barrel bowls on a baking sheet. Yes, I kept my fingers crossed the whole time. 6 cloves of garlic, peeled and finely sliced **I used 3 frozen DOROT cubes, and 3 cloves that I fished outta of some Garlic Confit I made last week. 1- In a thick-bottomed non-stick pan, slowly fry all the onions with the thyme, garlic and bay leaf in a good drizzle of olive oil and the butter. 2- Place a lid on the pan and slowly cook them for about 15 minutes, without colouring, stirring occasionally so the onions don’t catch on the bottom. The slower you can cook them, the better. Then remove the lid, turn up the heat and colour the onions until they are golden brown. This will encourage a sweetness and a real depth of flavour. 3- Add the stock, turn the heat down and then simmer for 20 minutes. You can skim any fat off, but I think it adds good flavour. 4- Correct the seasoning with salt and pepper. When it’s perfect, pour into your serving bowls and place these on a baking tray. Now what I like to do, instead of slicing the bread all pretty and proper, is to tear it up. It’s much more rustic and beautiful with all the knotty bits showing. 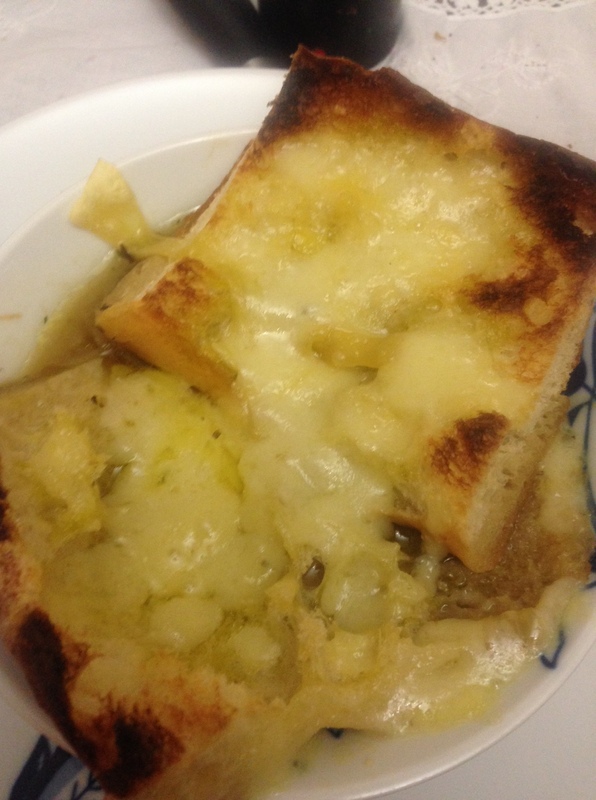 Put the bread on top of the soup in each bowl, then drizzle over some olive oil and put the Gruyere on top. 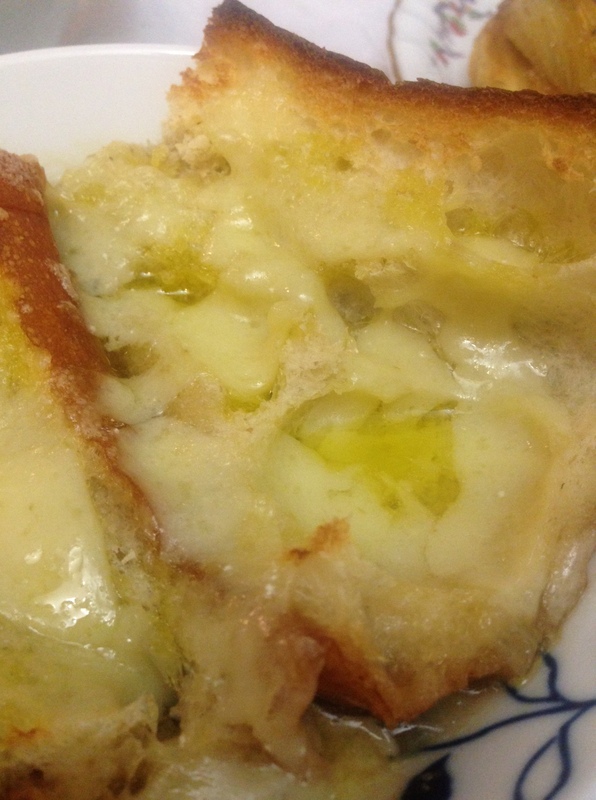 5- Place the baking tray in a preheated oven on a medium heat, or under the grill (be careful not to crack your bowls or burn the bread) to lightly toast the bread and melt the cheese. 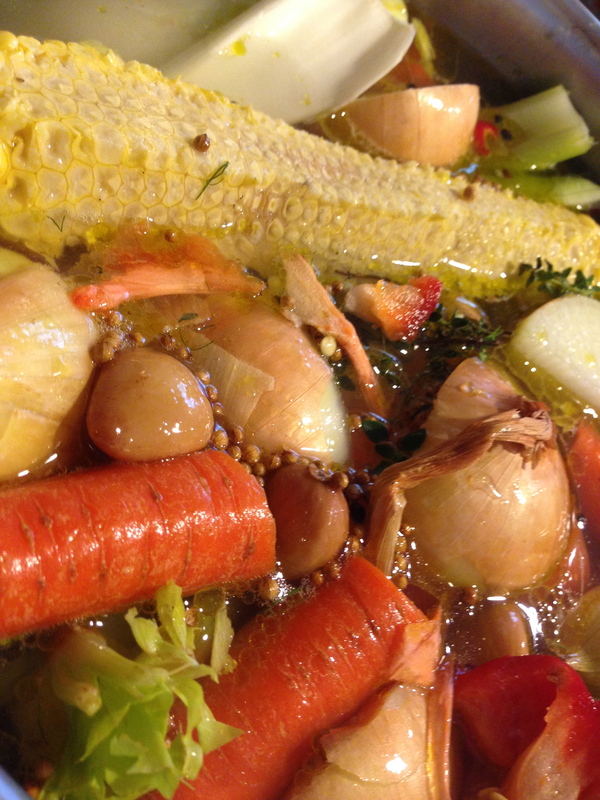 Basically, whatever veg peelings, scraps, ends you have on hand – you dump in a big old pot. Add in salt, a handful of peppercorns, and a glug of olive oil. Bring it to a boil, lower the heat and let it simmer about 15-30 minutes. Let it cool. Strain out all the solids and voila! You’re good to go. While you aim to have as your stock base celery, a few carrots (too many will make your soup too sweet), and onions with their skins on, basically you wash and roughly chop in all the random veg you have in the fridge. For me, today, it was 1 head of celery, some carrots, 3 onions, 1 red pepper, 2 corn cobs and 1 bunch of fennel fronds/stalks. Taa Daa! I remember Lidia Bastianich once talking on her tv show about her grandmother’s veg stock. What L’s grandmother used to do was after they finished a carton of milk, she’d rinse out the cardboard container, then pack it with all the veg peelings leftover when making dinner. Every night she’d put it in the freezer when she was done. She’d pull it out just to pack the peelings/leavings in, then put it back in again. When the container was full to the brim she’d peel away the cardboard and dump the peelings right into a big pot of water with a few parmesan rinds. Boil, then simmer, then strain – and there you go! A dinner made from scraps! I swear, little old grandmothers never throw out anything. C and I loved the soup. Like we LOVED the soup. The one comment was that I sorely lack in bread-topping-the-soup knowledge. I thought you were supposed to lay lots of bread across the whole bowl o’ soup, then cover with cheese so when it broils it gets all melty over the sides of the bowl. Turns out you’re only supposed to use ONE slice of bread. And it’s supposed to be kinda in the middle. Ah well. It was AMAZING. The twins each tasted the soup, then decided that they really wanted Apple Juice for dinner. That, and the side dish of roasted Butternut Squash. To be honest, R just licked the squash because ‘I yike the crunchy salt mommy’. R, after I told her to stop licking her butternut squash.